When you compare apples with apples, you will see that our estate magazine advertising rates are way below the industry standard for estate magazines. Why? In today’s economic climate, advertising tends to suffer. It’s a catch-22: You need to advertise because you need more business, but magazine advertising rates are generally too high for smaller companies to afford. We have set our estate magazine advertising rates at a price-point that will both help smaller businesses to get on the map, and to entice larger corporates to make more efficient use of their under-pressure advertising budgets. We calculate the current cost of our online estate magazine advertising rates based on circulation. Estate Life was only launched in April, and we will provide readership figures in the coming months. Estate Life Magazine’s current circulation is over 80 000 people, who receive their estate magazine directly into their inbox, either from the estate managing agents or via estate management apps such as Trafalgar or EstateMate. These people are all residents of gated communities in South Africa, such as estates and complexes. Find out more about our circulation. We also take the advert size into account. (Price is affected by placement only for the page 2 full page advert). Until we provide readership figures, the advertising rates are therefore special introductory offers, but you can be sure that our rates will remain substantially lower than other magazine advertising rates with similar distributions, once we include readership in our pricing. Not only because Estate Life is an online magazine, which enables us to pass print savings on to you, but also because we are committed to enable you to reach more customers for less. Book advert space now to secure your booking at our special introductory offer. 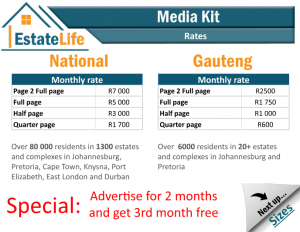 The Estate Life Media Kit has more information about advertising, including advert sizes, distribution, deadline dates and everything else you need to know about our estate magazine advertising.